The supernatural tale has a significant history in East Asia. Strange Stories from a Chinese Studio, in the Dover edition and recently updated by Penguin has long been a favorite for browsing, with its enchanters, ghosts, and other supernatural beings. A couple of months ago, I enjoyed reading Lafcadio Hearn’s retelling of some Japanese ghost stories in his In Ghostly Japan. 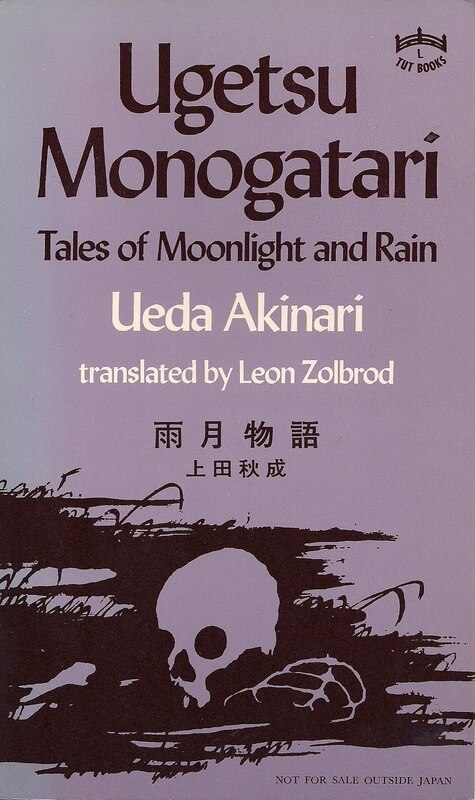 These tales put me in a cosmically fortuitous state of mind when, browsing a nondescript bookstore in a Scottsdale strip mall, a copy of Ugetsu Monogatari: Tales of Moonlight and Rain fell into my unsuspecting hands. This is a collection of supernatural stories written in the 18th Century by Ueda Akinari, most with settings in medieval Japan and reflecting a worldview steeped in Buddhist (and Daoist) mythology and ultimately derived from the literature of Ming Dynasty China. (According to the introduction, Akinari was particularly indebted to the Chinese collection “New Tales for Lamplight”.) 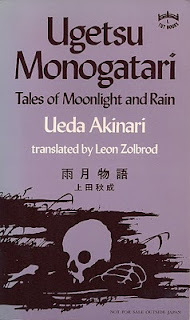 Moonlight and rain evoke romantic sentiments in the West, but translator Leon Zolbrod’s introduction explains that in Japan, ‘rain’ and ‘moon’ are contrasting qualities, with the former implying qualities such as life, love and passion, and the former evoking grief and melancholy, but wisdom and enlightenment as well. The stories evoke those seemingly precise aesthetics of Japan - the scent of pine on a mountain road, the rustle of silk, the gentle sliding of a rice paper door - and also contrasting elements such as a ruined mansion, a hoard of rusting weapons, an abandoned temple and a skeleton among the weeds. One of the best stories is “The Lust of the White Serpent”, wherein a studious young man is repaid for an act of chivalry with an offer of marriage from a beautiful noblewoman. Little does he know that he is under a dangerous enchantment - that the fine mansion in which he reclines is a ruin and that the beautiful girl is in fact a noxious spirit endangering his very soul. In these tales, the dividing line between our world of illusion and the deeper world of the spirits is thinner than a gauze curtain. It was also through this edition that I was made aware of Kenji Mizoguchi’s enchanting 1953 film “Ugetsu”, which reworks two of these stories (including the story mentioned above) along with a tale by de Maupassant into a parable of avarice, honor and seduction in the midst of a brutal civil war. The Criterion Collection edition of this film includes a beautifully done restoration of the film, a booklet with an essay and translations of the pertinent stories, and a lengthy documentary feature on the director. Reading your review has swayed me into wanting to track down and read a copy!.